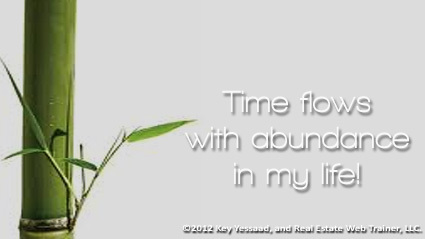 In the month of September 2012 I continued the focus of Thoughts of The Day around the topics of Time Management, Business Management, and how they affect the growth of the Real Estate Agent and Broker. 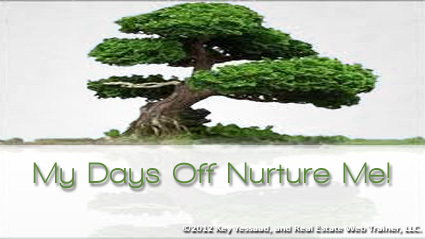 This ongoing daily Blog is nurtured by my coaching and training seminars and no matter how much technology is put in the hands of Real Estate Agents, there is one fundamental truth that seems to persist – preparing for one’s Business Day gives an edge to highest percentile of Real Estate Professionals. The theme of Prospecting and full integration within an agent’s Internet Marketing is also a continuing focus of the series. Share your thoughts and comments, and if you wish feel free to ask me a question. Be cautious of taking on projects, or clients, when the person hiring you works for a passive boss, or is in a relationships with a passive spouse. Think of this scenario: A couple walks in at an Open House, you do your job of showing them the property but only one of them is interacting. 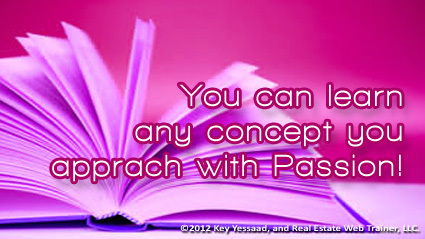 Things go well and you end up having what you think will be an easy Sale. The spouse doing all the talking seems to be in charge and the other spouse is there just for the ride; well – not so fast; you may have a passive spouse, namely a person who reserves the right to complain after the fact, and refuses to be engaged in the decision-making. I have just described a nightmare deal in the making; passive bosses and spouses like to have things done their way, and make lots of assumptions without voicing them; if you keep them unengaged you will pay the price of their wrath; because they will complain, and will do so with fervor and animosity. Never assume the talkative spouse is the decision-maker, they probably share in how the decision is made, and it is your job to draw out the passive partner and engage them with questions targeted to them only; you may even have side conversations with them while the other spouse is busy with other matters. Your sanity depends on understanding the dynamics of the couple’s relationship before you end up spending three months on a deal that will vaporize because one of them reserves the right of complain and not be engaged. 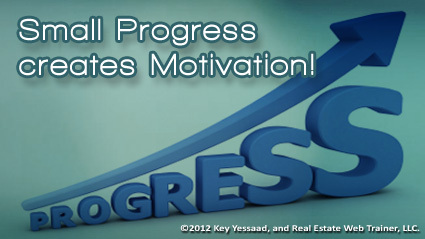 Little progress leads to more progress, and starts an acceleration towards meaningful Success. You maybe thinking that’s obvious Key; No no… This is a Psychological fact most people don’t know about themselves – indulge me. Behaviorist Clark Hull started the study of ‘Goal-Gradient Effect’ in 1932 and it can be reduced to this idea: ‘The illusion of Progress will create Motivation for more Progress.’ Here is a simple experiment, give 2 people each a card, one with 10 boxes the other with 12, and every time they buy a cup a coffee, punch a special mark on one of the boxes until the whole card is filled; as such point they will earn a free cup of coffee with a scone. Now take the card that has 12 boxes and punch the first 2 spots; in essence both people have 10 coffee purchases to go before they qualify for the free coffee and scone. Yet the second person with the card with 12 boxes, in which the first 2 were already punched, will feel more motivated and will tend to reach their goal faster than the first. This reveals an important aspect of our psychology; when we start making progress, even minor steps, the resulting motivating energy builds up to more progress, and starts accelerating towards the goals we seek. We must learn to break down our big projects into measurable accomplish-able tasks, and the resulting momentum will see us through our destined results. 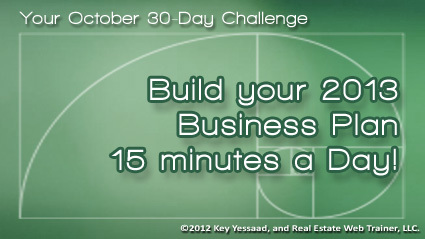 "Your October 30-Day Challenge if you are in Business for yourself. You have heard of 30-Day Challenges, they are repeated and focused daily tasks that help you develop good habits, by working on meaningful ideas a few minutes daily for thirty days. Done well these 30-Day challenges can help you breakthrough and bring about success, clarity to your conditions, and create progress in your business. Your challenge in October, if you choose to take it, is: ‘Build your 2013 Business Plan the Right Way’; here is how; 1. Get yourself a composition book to jot down your notes, or use something like evernote so you can capture your thoughts. 2. Spend 10 to 15 minutes daily, as early in the morning as you can, daydreaming about what your business will look like in 2013, and jot down any thought, imagination, vision, activity, tools you need to get, goals you wish to accomplish, trips you want to take, earnings you wish to accrue, family time you wish to enhance, anything that relates directly to your business growing meaningfully next year. You must write down any call to action your mind tells you is in your best interest, and don’t be afraid of going into the fantasy of success – you will be able to ground it with activities once your vision has clarified. 3. Finally organize your vision and activities into a plan of action, and place them as activities in your Calendar – then act on them methodically. This is your 30-Day Challenge for October – I hope you will take it on; I promise it will be one of the best things you have done in a long time, and go ahead and share this challenge with your colleagues and collaborate with them – there is power in group activities." "There is a field of scientific inquiry and psychology that tries to reveal the ideas that we may not know about ourselves; the truth is we are all in a race of discovery towards what we are capable of being, doing, and becoming. One of these facts about who we are should intrigue you: ‘We are all wired to know things we have never done before.’ That’s right, scientists call this ‘mental modeling’; psychologist Susan Carey defines it as such: ‘A mental model represents a person’s thought process for how something works (i.e., a person’s understanding of the surrounding world). Mental models are based on incomplete facts, past experiences, and even intuitive perceptions. They help shape actions and behavior, influence what people pay attention to in complicated situations, and define how people approach and solve problems.’ So this inherent wiring should encourage you to continue leaning new concepts and pushing the boundaries of your expertise; do a little learning daily; and please, please, I beg of you, stop saying that you are one those people who cannot comprehend technology, science, math, engineering, computers, etc…; – Science says you can… Yeah!!!" "Many Business Entrepreneurs, and that includes Brokers and Real Estate Agents, have a hard time sleeping at night; their mind continues to race trying to sort out their to-do list. They try their best to shut it down and it just won’t; some of them even end up waking up several times to jot down a note here and there but to no avail – they end up catching a few hours of sleep and functioning like zombies during the day. There is a simple diagnosis for this condition – you are using your mind as storage for your tasks, calendar, projects, commitments, worries, and contradictions. 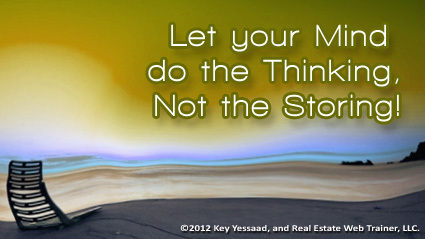 The more you store in there the more your mind wants to work on your tasks – that’s what minds do. You see the problem is your ‘organizational system’ is flawed, you are not using task lists, calendar events, and daily and weekly reviews to process your activities – you let them float in your mind and when you are ready to rest they float back up and demand your attention; which is the last thing you want to do when you are ready to sleep. It is your constant worry and preoccupation with all of the things you have to do that consumes the largest amount of your energy and anxiety. Do something about it, craft an activity based business plan, get a smartphone and learn to use it, plan your days, and review your activities on a regular basis – You can do this!" "The economic recession and Real Estate slump of the past few years required many brokerages to make tough decisions; marketing budgets were slashed in order to keep the doors open; administrators were either let go or saw their hours reduced drastically; and most if not all funds for local community outreach, events, or young team sponsorships were decimated. The difficulty with a rebounding market, although a slow one, is many brokerages are still shell-shocked and are not ready to re-establish the necessary funds to regain a foothold – and those who do are gaining an edge. Let me share an example: There is a broker who used to have a sizable presence in local Real Estate Magazines, cut it during the recession to near zero, and still believes that local visibility in magazines is near zero – the problem is he did not check, he just kept using the information of years back to continue to validate the inaction of today. Re-engagement and statistics will be a better guide than historic assumptions – get to know your business again; you may be surprised at the opportunities you are missing." 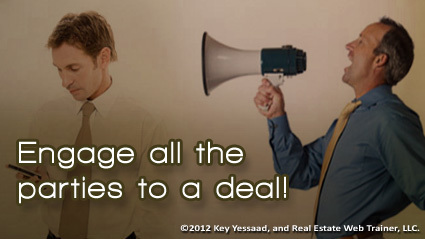 "In order to grow your business, especially a Real Estate Brokerage, you must hire a taskmaster. A Taskmaster is someone who thrives in the ‘Doing’ mode; they naturally look for ‘the next action’ in their tasks. Taskmasters, when working and planning projects, think in bullet point form and like to get to the end of their projects. If your manager or administrator is not turned on by steps, tasks, and completions with clear end points then you have not hired the right taskmaster. 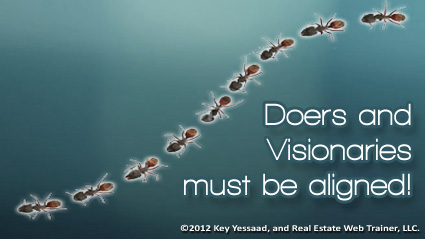 A good Real Estate Business is built upon the vision of its owners and implemented with the help of managers/administrators, and this is why, on a weekly basis, the ‘Visionaries’ and the ‘Doers’ get together so they can align everyone to work in the same direction, with a spirit of cooperation and enthusiasm." "How far ahead you plan your meetings, sales meetings, and gatherings may tell you more about your business vision than you think. 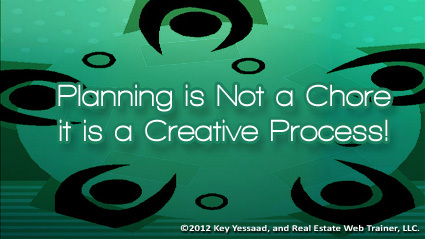 Planning meetings does not mean the mere addition of such to your calendar; planning meetings, especially Real Estate Sales Meetings, means having a clear grounded agenda with prepared topics and an organic center of learning. Businesses that do not operate with a vision rarely plan their days, weeks, or years – they are reactive enterprises that let the business day dictate what shall the bounty or hunger to be bestowed upon them. In Real Estate you have to have the balance of the Visionary and of the Doer – you never let one consume most of your time, and if you are a broker you will find your business truth in your relationships with your meetings and how you prepare for them." "Business Commitments are not always easy to tame and keep aligned, some of them can turn out to contradictory, and what is interesting it is all of our own doing. Good project management means that you align all of your activities with your core commitments and try to reveal the conflicts that may arise. Example of such misalignment would be your desire and commitment to become the best foreclosure expert in your market, but hate to work with asset managers at banks – this a sure recipe for disaster. The Chinese Philosopher Mencius said: ‘If you know the point of balance, you can settle the details. If you can settle the details, you can stop running around. Your mind will become calm. If your mind becomes calm, you can think in front of a tiger. If you can think in front of a tiger, you will surely succeed.’"
"Try these few questions when you get a chance and see if you can muster some truths about yourself, and why things are the way they are in your business. The first one is: ‘What part of your business, life, or work could you objectively say that you were truly ‘Organized’ in?’ let’s follow that question with some observations: ‘What is it that you care about that causes this part of your life to be well ‘Organized’?’ Don’t take these two questions for granted, they will illuminate a strength that can help you grow your business. Now, let us look at the areas of your life/business that may not be as organized: ‘In what part of your life or business are you disorganized?’ and the follow up observations you may wish to make here are: ‘How is your life or business affected by this disorganization? and it is causing you a loss of revenue, opportunity, and/or peace of mind?’ If after tackling honestly and authentically all these question, and can come to the realization that being ‘Organized’ could be a choice and hides more potential than you give it credit for, you will start noticing that you daily business will become more intentional." 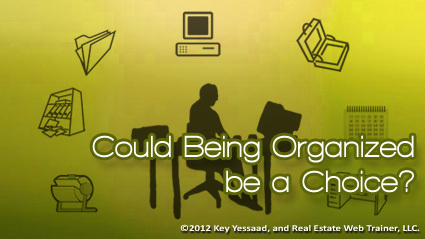 "Does being organized and methodical mean that you will affect and reduce your creativity? Some actually believe that messiness brings about creativity; in fact there is no such direct correlation. Some think that creativity lives in the heart of artists – in fact it lives in all of us; it requires passion and desire to stir it to the fore. When you choose to be organized and dedicate a portion of day, 20 to 30 minutes, to attending to your upcoming meetings, following up on your promises, organizing your calendar, arranging your tasks by importance, but mostly preparing yourself to generate business rather than just react to your email and phone, then you are allowing for creativity to find a vein of rich expression within you – try it; you will come to the conclusion that Organization and Creativity can tango together quite well!" "There is a nugget of truth in the Real Estate Business that gets forgotten by Agents and Brokers from time to time, and this nugget causes many to experience a reduction in their business growth. Real Estate Prospecting is about talking to people effectively; postcards, letters, emails, door hangers are not Prospecting – they are marketing material for potential conversations. 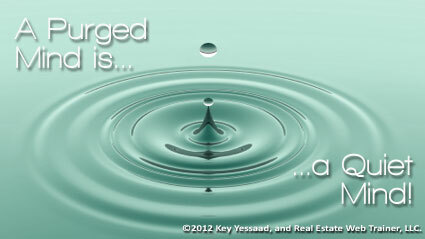 This is how you know whether you are Prospecting or not: Are you talking to Sellers about their property? And the primary means of effective conversations are one on one (door knocking) of over the phone (watch for the Do Not Call Registry.) And let us be honest about Door Knocking; it is not tough technically – it is tough emotionally; the fear of rejection causes many to quit too early; they then decide that working with Buyers must be a better strategy. 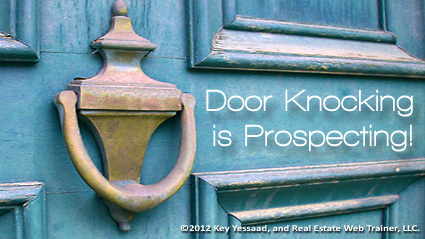 All of your Marketing, Print, Video, Internet, and SEO must lead first to conversations; and your Long Term Business Success in Real Estate MUST be tinged with Effective Prospecting, or let’s call it what it really is: Door Knocking. 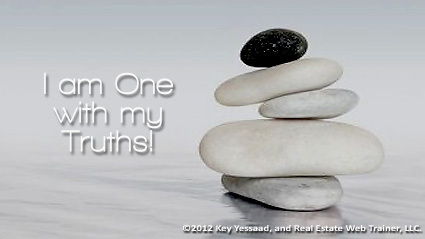 Remember this obvious truth – we know where the majority of Sellers live!" "Understanding the flow of energy for business entrepreneurs is crucial; but in order to do that we must understand the flow of energy for employees. One main distinction between someone who works for themselves, as say Real Estate Agents, and say salaried bookkeepers is simply that when external breakdowns occur for the employee that are outside his or her control the salary is not in jeopardy. Say a computer virus hits the organization for which the bookkeeper works, and all of their computer systems go down, the bookkeeper is required to be at work and maybe help to resolve the issue, but since the computers are down he/she is not able to perform their bookkeeping duties but will still get paid – that is logical. Unfortunately no such breaks are to be expected by Real Estate Agents – when a breakdown takes their ability to work there is no income – and this reality is accepted by successful agents. This leads to understanding energy flow; when a deal goes sour and starts commanding most of your time, especially away from prospecting and generating new business, your income will suffer. Energy flows from highest potential to your lowest breakdowns and turmoil; and the more you drag sour deals along the more they effect your production. 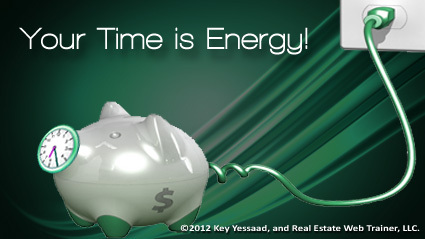 The only commodity you cannot make more of is time; and time is energy!" "What are IXPs? 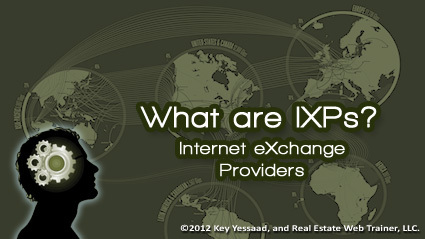 The acronym IXP stands for Internet eXchange Point. IXPs are physical internet infrastructure used by Internet Service providers (ISPs) to keep content as close as possible to Web visitors. Ten years ago the internet trafficked about 1.5 Tbps (terabits per second; 1 terabyte equals 1,024 gigabytes); today it has exceeded 75 Tbps - think of it this way: it is the equivalent of downloading all of iTunes music once every second. As the internet continues to be adopted by more and more people, and not just for entertainment, but for large scale business services, it is crucial for ISPs to have Servers that keep data as close to possible to Web visitors. These content reservoirs have for example reduced the total bandwidth in the US from international web visitors from 90% to 40% which of course reduces latency for visitors from within the US. PS: Did you know that with the advent of Smart Phones and Tablets that AT&T and Verizon are fast becoming some of the largest ISPs in the country?" 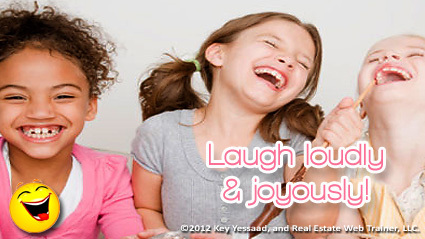 "Laugh a lot... yes make sure to have laughter in abundance in you life... Running a business is a demanding endeavor and surrounding yourself with friends and colleagues you can laugh with can be the best medicine many a times. The barriers of business negotiations can be easily overcome when good laughter is present, it allows us to return to our humanity and disarm any entrenched position. Of course you cannot and should not fake it – you have to be it, and the easiest way of doing so is not to take yourself too seriously; being a goofball while still being serious about your business are not contradictory. Andrew Carnegie put it this way: ‘There is little success where there is little laughter; but I particularly like what Victor Borge said: ‘Laughter is the shortest distance between two people.’"
"Understanding MERS – There was a time when mortgages were not complicated and easily understood; ‘a Mortgage is the charging of real estate property by a debtor to a creditor as security for a debt, on the condition that it shall be returned on payment of the debt within a certain period.’ Everyone knew the mortgagee and the mortgager. In the Nineties Banks got antsy and wanted to generated more loans but needed to clear their books first to raise funds and so was born MERS, the innocuous Mortgage Electronic Registration Systems. 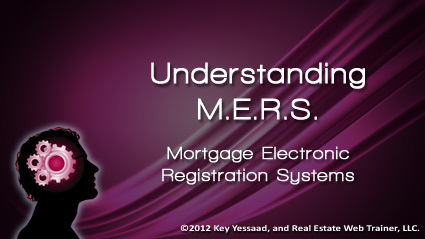 MERS is in essence a clearing house that packages loans into mortgage–backed bond securities that are then sold and transferred between investors. This has caused a grayness between the relationship between Mortgagees and Mortgagers; in others words who is the real debtor? Yesterday’s Court Ruling by The Washington State Supreme Court held that MERS’s business practices had the ‘capacity to deceive’ and it means that when banks used MERS to foreclose on a consumer, said consumer can actually sue for fraud. The heart of the problem was when banks put MERS’s name on the deed to facilitate transferring properties between entities and to speed up the process of recording deeds. Needless to say it is safe to ascertain that we have years of lawsuits and uncertainties in the Distress Property Market." 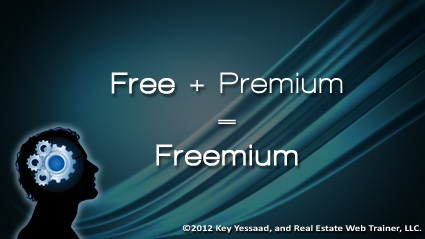 "One of the ways to understand the concept of Free is to truly put it in perspective; there is an old adage on the internet that goes something like this: ‘If you are not paying for a product, then you are the product.’ It is a useful way to make decisions about the tools you are using that come for free; and the most useful information that can be garnered about you is your purchasing habits, and your internet habits. The Freemium Economy continues to expand because it allows for the adoption of platforms very quickly, and one of the most important battles going on right now is the battle of the ecosystems: Apple versus Google versus Amazon versus Microsoft, with Facebook trying to align itself sometimes with Microsoft and sometimes with Apple. You are first enticed into an ecosystem with free or nearly free gadgets and apps, and once locked in the true selling begins. This note is not about whether there is anything wrong with it per se, but awareness is power!" 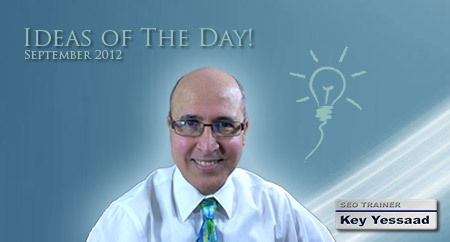 "What is the shortest distance between you and your business success? 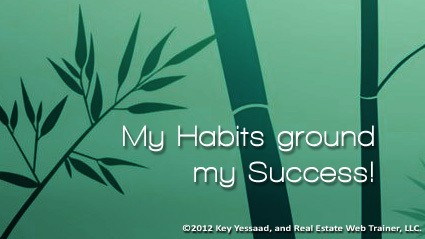 Your Habits! Yes, your habits are more important than your expertise, your knowledge, your technical gizmos, your good looks, even more important than all your college degrees and licenses. It is important to understand that all the previous qualities are crucial to your business, but without Good Habits they are squandered in the winds of desire. Your habits, when designed to tie in with your vision and business plan, become the synergistic glue towards accomplishing all of your projects. In fact Habits are more important for Entrepreneurs than corporate employees – entrepreneurs work for themselves and they tend to squander many opportunities if they are not boxed in – your habits are supposed to be the box of your success. I am sure you have heard that that it takes 60 days to form a habit; you must also keep in mind that it takes 21 days to form bad habits – it is unfortunate but true; it takes three times as long to form a good habit than it does to form a destructive habit." "It is impossible for trains to stay on track without proper rails; and this simple illustration absolutely applies to all of us in the arc of our business endeavors. You may think that trains don’t have the freedom to roam in any direction they desire and are in fact constrained by said rails; I say the rails guide them to clearly deliver effectively and on time their goods, and do it often predictably. 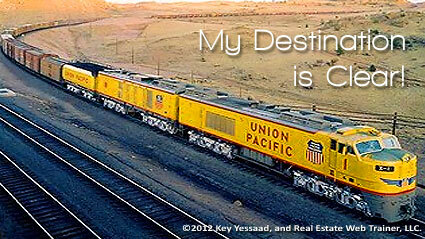 The rails of your business are the daily activity tasks that guide you to your business goals; they are the calls you must make; the doors you must knock on; the emails you must respond to; the pictures and videos you must take for marketing your listings; and so on… deviate from these rails and you are now hurting the business you have created. Does this means you are losing the freedom you thought you had? – No! 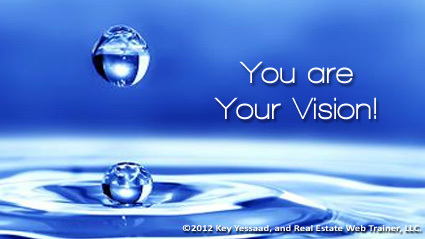 It means you are honoring your vision by being diligent. Make sure your rails are were built and inspect them often; then let the train of your business success speed towards your goals!" "Feeling good about your days off with your family and friends is hard if you are not centered during your workweek; we all know that you have to keep moving the ball forward and staying on top of your commitments, especially with your current Real Estate Buyers and Sellers. An effective question to ask yourself on Thursdays that can help you feel good about not working during your days off is: ‘What do I want to have accomplished by the end of my workweek so I can feel good on my days off?’ Make sure you do this every Thursday while in front of your calendar, task management systems, and client list. The question may seem plain on the surface but I promise you it will trigger lots of broken commitments and will give you a chance to regroup. You are in essence bargaining with yourself to find your core business rhythm and yet continue to have a good quality of life. Give it a try!" "Every business will be forced to confront some sort of transition, especially when you have the clarity of a well-written business plan. 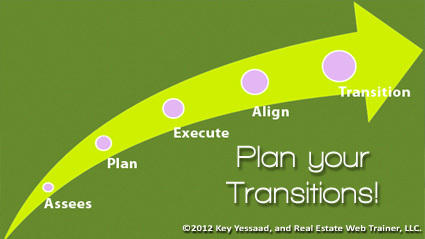 Transitions are either planned or reacted to and yes they bring emotional agony that leaders must confront. Businesses that fail to prepare for the worse case scenarios are setting themselves up for lots of heartaches, and many such bad scenarios are easily fathomed. Here is a simple jarring example, if you are going to build a growing Real Estate Office with the goal of 15 to 25 agents doing 150 to 250 transactions a year you will not be able to do it with a part-time administrator. You may try the route of multiple part-time administrators to keep cost down, but all you are doing is deflecting accountability and creating the conditions for one to blame the other for projects not handled well. If you have the courage to write an activity-based business plan you will easily discern your worse case scenarios and prepare for them as a strong leader." "The essence of a vision is something akin to a lie we tell ourselves about the future, a hopeful lie, a desired lie we wish to live, one that looked at with our eyes today feels like a lie – but once lived in the presence of its reality feels so right, so true, and so authentic. A vision forces us to take stock of today’s conditions and realize that we must get to work to improve them; it reminds us of how much we are capable of achieving when our instruments have been tuned to play our music. The best wish I can bestow on a friend, family member, or colleague is: 'I wish you to live, breath, eat, sleep, and toil in your career of choice; the one that has you be exactly the vision of you!'" 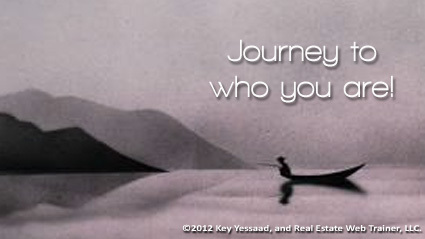 "Is a Real Estate Career an entrepreneurial endeavor or a job? Resist answering this question too quickly; some, new to Real Estate, do like the way Agents are compensated (commission) and the freedom they enjoy going and coming as they please; but I still call many of them employee-centric agents. You know you are in the presence of this job-security mindset when the habits of said agent are on processing transactions, and rarely on prospecting for new business. Some of them truly believe the following: ‘The Brokerage should generate the business (Leads and Clients ready to sell and buy) and I will process the paperwork!’ This is shocking, and the fact that many brokerages still hire and allow such mindset is doubly shocking. An entrepreneur creates the conditions of business around them; they have clarity that generating a growing clientele by prospecting is always top of mind; but it is their resilience and imagination to move through all sort of business conditions and still eke out a sale that makes them true entrepreneurs." "A 40-hour work week in Real Estate is outside the realm of reality for many, but those who go beyond 60 hours are damaging their best investment, themselves. The ability of Real Estate Agents to juggle multiple scenarios in order for a transaction to proceed properly is crucial; we all know that no two transactions are alike – this ability requires a keen mind and a healthy body. So I ask you to confront this easy question from time to time, especially those who have spouses and kids waiting to spend time with you: ‘What would it take for me to end work on time today and feel good about it?’ This question has an urgency and mind clock behind it; it reminds you that you maybe dilly dallying on some of your projects and should work on them right now, and maybe say no to some social calls that end up stretching your day. The bargain you make with yourself about getting to work should not be more powerful than the one you make about leaving work." 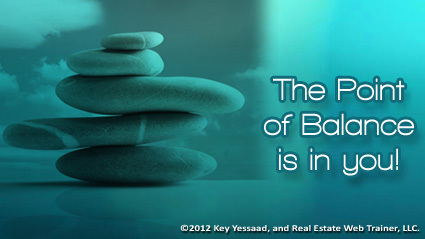 "The Business of Real Estate is a Business of Trust and Authenticity; it is anchored in your interactions and your authentic self. Yes, as the Real Estate Professional, you must be knowledgeable, punctual, dependable, technology savvy, and a great resource of Local Real Estate Information – but that’s not enough; customers want that feeling that they are working with someone they trust. Your humanity is your best asset in being helpful to customers – they are not hiring a machine; they are hiring you. Trust is fomented in the conversations and back and forth correspondence you nurture with your clients; and the biggest culprit is deals going awry is poor or bad communication. 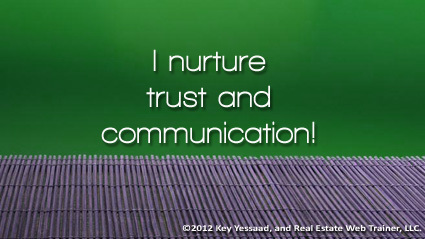 Nurture your relationships and trust will be present!" "The few moments of Quiet that you are able to squeeze out of your day are as nourishing as the food you must partake in daily; you must go out of your way to make these moments your own and for no other purpose than being. 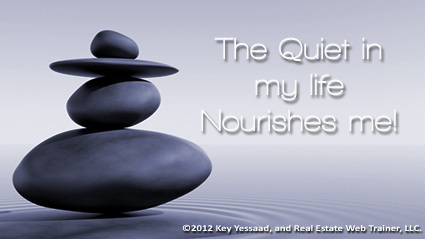 The world around us is very noisy, and for those of you in Real Estate, your day is full of chatter, as it should be - but it can get to you if you are not able to turn it off from time to time. Your best ideas will come to you when you allow your mind just to be with no other purpose than just being. As Albert Einstein once said ‘The monotony and solitude of a quiet life stimulates the creative mind.’"
"Very few of us have perfect business conditions and systems – this is why Businesses need vision statements and grounded Business Plans; something to strive for, a way to push beyond the daily muck of challenges, rejections, and failures. The best improvements Real Estate Agents can make must deal with their habits – and before trying any illusion of changing said habits a true accounting of what is currently happening must take place. A Real Estate Career is not a routine job like say that of being a Bookkeeper or a factory sheet metal welder; Real Estate Agents don’t go to work – they create their work daily. 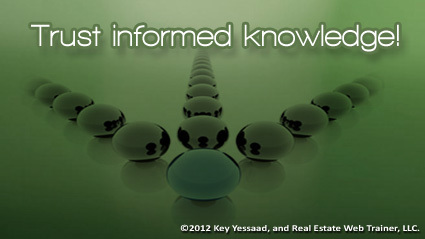 When Real Estate Agents and Brokerages design Business Plans they must be aware of the Threes (3s) – 1. Ongoing Generation of Business (Prospecting); 2. Diligent Management of current contracts (Processing); 3. Never Ending Personal Training and Agent Growth (Personal Growth.) Alvin Toffler puts it this way: ‘You've got to think about big things while you’re doing small things so that all the small things go in the right direction.’"
"There is a simple question that can trigger a torrent of thoughts, emotions, and force you to refocus on your vision. A question that shines on the truth of why you may not be producing the results you desire: ‘Do you find yourself doing certain tasks in order to avoid doing your most important tasks?’ This question is at the heart of you being honest with yourself about your business and its future; it is very seductive to tell yourself I have been working hard all day and been extremely busy; but were you possibly deflecting to have the illusion of work? 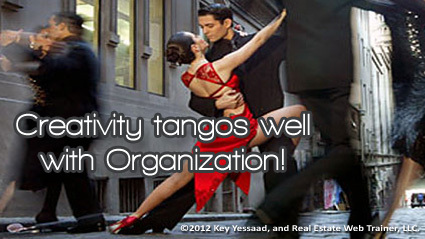 in Real Estate being busy is very easy to concoct – but being busy with activities that generate business are Hard Work; Prospecting is hard work; Door knocking is hard work; Holding proper Open Houses with the right Marketing is hard work; Cold Calling and following on Clients is hard work. Remember this question is asked by you and of you – are you Deflecting or are you in the forefront of your Business Success?" "It is nearly impossible to empty your mind, in fact your brain activity never ceases; and this is good news – it means that you can focus on projects and see them through; this feeling of being in the zone is quite rewarding. The culprit that keeps you from experiencing many more of these ‘zone’ moments is the same mind of yours; it is always trying to remind you of broken promises, forgotten appointments, unfinished tasks, lies that you must remember, wrongs that you must right, etc… Your mind does a good job of playing accountant and tries to help you recall and bring to the foreground your promises and your vision. So you have to quiet said mind by giving it time on a daily basis to purge itself; when you choose to take 10 to 15 minutes a day to put in writing (in your calendar) all your commitments, transactions, appointments, and track them, you allow your mind to work for you on tasks that help you grow your business." "This simple quote says it all about being who you are, exactly with the tools you have, and the spirit you currently possess; American Professional Photographer Chase Jarvis was paraphrased saying: ‘The Best Camera is the one that you have with you right now!’ Simply put: If you are a photographer, and in the business of photography, do not wait until you get a super duper camera to start becoming The Professional Photographer you wish to become. You may seek to wait until all the planets line up in order for you to succeed; yet it is your current intellect, drive, and desire that will guide you to being successful. 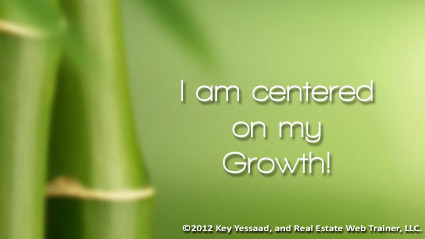 Stop waiting for your day to start – grab your current opportunities and trust in your journey of professionalism."